The moment you mention “Poker Game”, what first comes to the mind of a typical player is Hold’em, especially Texas Hold’em. However, there is more to understanding poker games than Hold’em; there is Omaha and other variations of the game of poker. There are seven main variations of poker including Omaha and Omaha Hi-Lo, Stud Hi-Lo and Five-Card Triple Draw Lowball, Stud and Razz, and finally Hold’em. But, the real trick for every new player in the game of poker is how to differentiate between the many variations of poker, for example; how to differentiate Omaha from the popular Texas Hold’em. This article and the sections that follow are aimed at helping new poker players gain a better understanding of the various “Poker Games” and learn how best to win! Generally, the “Game of Poker” is a cluster of different types of poker games that can each be played with a standard deck of 52 cards and in some cases an added Joker Card. There are several different types of venues where the poker game can be played too, including offline and online poker games. Poker is also played in tournaments, whether online or offline. 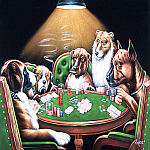 Poker, as popularly believed, does not only involve betting for a win; it also involves individualistic plays. Whether it is by betting or by individualistic play, the winner of the game is determined by a complex card combination and ranking. Some of the poker cards are never revealed until the game comes to an end. Actually, this hiding of some cards is part of the winning tricks and strategies in the game of poker. However, the number of cards hidden depends on the variation of the poker game being played. As a new poker player, one of the tricks you must learn in order to win the game of poker is the betting tricks. These are known as the betting procedures. One of the poker betting basics every new player is expected to master is the blind betting basics. There are two types of blind bets in the game of poker. These are known as the “Big Blind” (BB) and the “Small Blind” (SB). The winning strategies of every game in poker are tied to the players’ ability to manipulate the Big Blind and the Small Blind. This is because the entire betting procedure is dependent on the blinds, starting from the “pre-Flop” to “The Flop” to “The Turn” to “The River”. For example, during the blind betting process, the player who is in possession of the blind performs the pre-flop ritual or makes first bet. This could be very deceptive since it gives the player a delusion of being at advantage. Unfortunately, the blind holder who makes the pre-flop is also the last player to perform the three last betting basics including the post-flop, the turn, and finally the river. This definitely cancels his initial advantage against other players and then places him at a disadvantage. These are required bets, which poker players make in every poker game hand before any cards are dealt. The stake you hold as a player determines the amount of blinds to be made during plays. You must note the betting limits and the low hand / high hand splitting of the betting pot. It’s a bit different in modern poker games. In modern poker games the betting procedure begins with the ante or forced bet, which is initiated by one of the players who initiates a forced bet. In both modern and standard poker, the betting process moves clockwise till each player either folds by losing all previous bets and all accruable interests, or matches the highest bet made so far. Then, the player who matched the bet initiates the next round by raising or increasing a bet. This betting procedure will continue until every player has matched or folded a bet. Poker, which became a common pastime game among sailors along the Mississippi River, is known to have become a popular game from between the 18th to the 20th century. Of course, in 17th century France, Poker had become popular in the form of “Poque” before crossing the Atlantic into the French founded City of New Orleans. However, history of the game dates back to the 10th century in the Chinese Sung Dynasty and traced to the 16th century Persian enclave. The Game of Poker is considered to be as old as the Persian “As Nas” game as it supposedly has been around for over a thousand years now. By 1970 the game of poker became a global event with the establishment of the “World Series of Poker” which was first won by the legendary Johnny Moss at Binion’s HorseShoe in Las Vegas, Nevada. Since then, many other poker legends have merged on the horizon! "How do I bet so that the hand I have will be ranked highest?"